This annual report, created by the SF Dept. 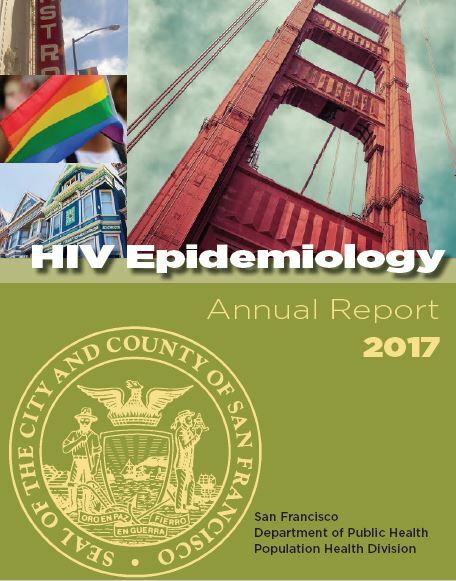 of Public Health, is an exhaustive report on the current state of HIV in San Francisco. We’ve parsed out some of the key points below. You can also read the full report. declined 5% from 233 diagnoses in 2016 to 221 in 2017. 28% of people living with HIV are over 60 years. in San Francisco, at 116 cases per 100,000 population, compared to a rate of 39 per 100,000 among white men in 2016. Latino men in San Francisco have the second highest HIV diagnosis rate at 68 per 100,000 population. Among women, African American women have the highest HIV diagnosis rate at 43 per 100,000. The annual rate of new HIV diagnoses declined 5% from 233 diagnoses in 2016 to 221 in 2017. African Americans in San Francisco are the only racial/ethnic group where new diagnoses are not declining; instead the number of new diagnoses slightly increased in 2017 to 37 compared to 33 new diagnoses in 2016. Homeless persons are lagging behind in viral suppression at 32 percent compared to 74 percent overall for HIV positive people in San Francisco. 94% are aware of their HIV infection. This is a testament to the effective HIV awareness efforts in San Francisco. Survival with AIDS has steadily improved overtime; for people diagnosed, the survival probability is 90% at 3 years and 86% at 5 years. People who inject drugs (including MSM-PWID) have the lowest viral suppression among living cases with a known transmission category, both 67% compared to 74% overall. This highlights the need for continued support for the long-standing syringe access programs in San Francisco and the importance of implementing new, effective approaches. Linkage to care within 1 month of HIV diagnosis has increased among newly diagnosed people; in 2016, 83% linked within 1 month of diagnosis compared to 77% in 2012. Viral suppression within 1 year of diagnosis has increased among newly diagnosed people; in 2016 85% were virally suppressed within 1 year of diagnosis compared to 68% in 2012. Time to ART (Antiretroviral Therapy) initiation after HIV diagnosis has improved from a median time (when 50% initiated ART) of 3 months in 2011 to less than 1 month in 2016. Time to viral suppression after HIV diagnosis has improved; median time to viral suppression improved from 6 months in 2011 to 2 months in 2016.